Katia Roma scarf yarn, 41, soft brown with shades of gold. Lacy mesh ribbon with a scalloped edge, approx 5cm wide. 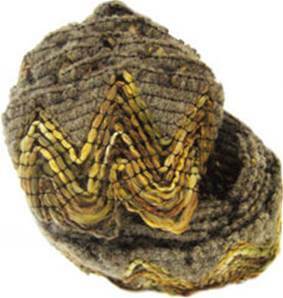 47% wool, 40% acrylic, 13% nylon. 13m per 100g skein - 1 skein makes a scarf. 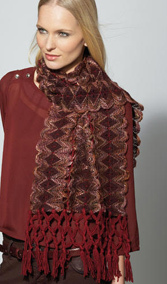 Simply crochet 2 strips together to create a lacy scarf or knit it in to a garment to create a feature panel or ruffle.